The trouble with Social Security disability appeals « Hercules and the umpire. This is a photo of “petroleum-free” lip balm with a SPF rating of 15. The SSA apparently handed out this handy health care item as a promotion. 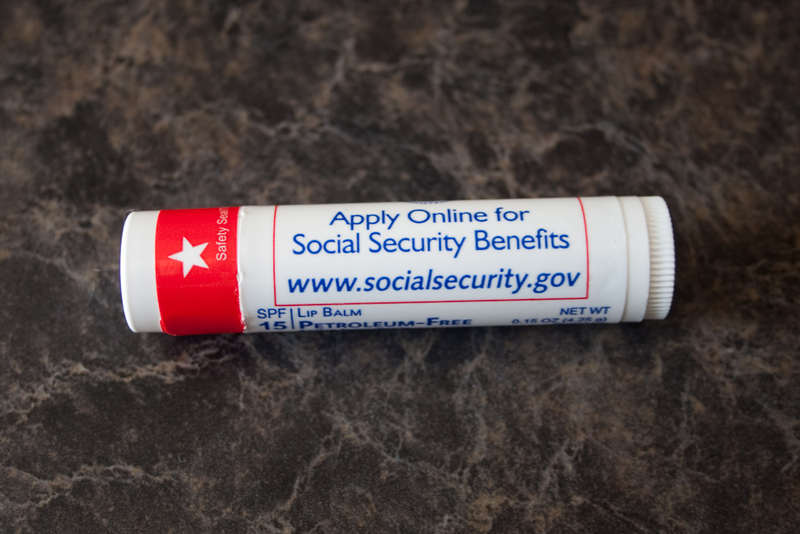 The container urges the user to apply the balm while also applying online for Social Security benefits. Obamacare for the lips? Very weird. Photo credit: Aric Riley’s photostream per a Creative Commons license. If you apply for social security disability benefits and your application is denied, review can be sought in a federal district court. These are significant cases. “If a claimant wins his or her appeal, the average cost of lifetime benefits is approximately $300,000. Should a claimant fail to prevail, the family may be facing financial ruin.” Association of Administrative Law Judges, Meeting the Challenges Ahead. As with bankruptcy law, social security law is complex and arcane. Unlike my very favorable view of certain specialist tribunals like bankruptcy appellate panels (BAPs), I am a strong believer in review of social security disability denials by federal district judges. These appeals are both hard and frustrating. I know because every once in a while I will do one myself from scratch (without help from a law clerk). When I do, I am confronted with a huge record replete with pages and pages and pages of medical records. Additionally, and more frequently than I would expect, there is sometimes a mismatch between the opinion denying relief and the record. And all of this brings me to a delicate but critical point. The social security appeals we deal with require review of a decision “authored” by an Administrative Law Judge (ALJ) who is employed by the Social Security Administration (SSA). I know several of these judges, and I have a very high regard for their integrity, competence and work ethic. But, frankly, there are serious problems with a fair number of the opinions “authored” by ALJs. The SSA confronts a huge docket of disability claims. In FY 2011, the SSA received around 3.3 million disability claims and there was a large backlog of cases. Meeting the Challenges Ahead. In turn, the ALJs are expected to turn out decisions at a dizzying rate. For example, between September 29, 2012 and March 29, 2013, which included 122 working days, the number of dispositions per day per ALJ ranged between a high of 3.17 per day to a low of 1.50 per day. Hearing Office Dispositions Per ALJ Per Day Rate Ranking Report FY 2013 (For Reporting Purposes: 09/29/2012 through 03/29/2013) (segregated by hearing office). In Omaha, where many of our cases originate, the rate per day per ALJ was 2.44. Id. While the SSA is to be complimented for being transparent, these numbers are chilling to me. To make matters tougher for the ALJs, after they make their decision in chambers, an opinion must be written. But they don’t write their own opinions. Rather, they send their notes to a paralegal or sometimes a lawyer to write the opinion. The ALJ is then supposed to review and approve or edit and then approve the opinion. However, the quality of the decisions varies greatly according to the skills of the opinion writer and the time the ALJ can devote to editing the opinion. For example, according to one disgruntled judge, “a lot of the writers are under a great deal of pressure to produce numbers of decisions. You can not have quality and quan[t]ity. Something has to give. As an ALJ you will not have the time to write your own decisions. You will be lucky to find the time to edit them.” ALJ Discussion Forum (March 22, 2013) (bartleby). I am writing you concerning a matter of extreme importance to the Social Security Administration (“SSA” or “Agency”), the AALJ and, we believe, the American people. Succinctly, that matter involves the unlawful imposition by the SSA of an illegal production quota upon administrative law judges responsible for appeals from disability claims denied at the state level. As you know, the Administrative Procedure Act, as well as the Social Security Act, guarantees the decisional independence of all federal administrative law judges. Those federal laws as well as the United States Constitution also guarantee the procedural due process rights of disability claimants. SSA, in derogation of these rights, is enforcing an illegal decisional quota upon administrative law judges and is enforcing a series of illegal “Benchmarks” in furtherance of the quota, requiring administrative law judges to adhere to arbitrary deadlines for designated stages in the hearing process. Perhaps most troubling is that the quota is the result of fiscal, political and other extra-judicial considerations, exactly the type of pressures the United States Supreme Court in Butz v. Economou,438 478 (1978), made clear were anathema to decisional independence. Moreover, this conduct is precisely the type of conduct the U.S. Congress intended to eradicate by enacting the Administrative Procedure Act. Should you choose not to address these concerns, the AALJ is prepared to take whatever steps may be necessary, including litigation, to protect the decisional independence of administrative law judges, the procedural due process rights of the claimants and the interests of the American people. Individual administrative law judges have also expressed an interest in asserting their own rights in conjunction with the AALJ in possible litigation. To be crystal clear, I have no opinion about the dispute between the ALJs and the SSA. I favor neither side. I highlight this dispute only to show that there is a strong “real world” justification for Article III review of important Executive Branch decisions like the denial of Social Security disability claims. While the review of these decisions are burdensome to federal district judges, they are also as important as other types of litigation that garner much greater attention. Actually, the AALJ filed a complaint in the Northern District of Illinois on April 18, asking for declaratory and injunctive relief. The complaint is available on the AALJ.org website, or through PACER, of course, case #1:13-cv-02925. Have you listened to this episode of This American Life? It should be required listening for anyone involved in the disability process, including the judiciary… in fact, perhaps especially the judiciary, who are somewhat removed from the rest of the process. Truly, I don’t care, but consider the following: When you comment, the program I am using automatically displays your IP address. Because of that, I know that your comment was sent from an IP address that is the same as the one I am now using to write this reply. I trust you understand what that means. So, if you want to be really anonymous, you probably ought to use your home computer or a mobile device. Again, I really don’t care.